Visit the March for Cannabis Facebook event for more information: goo.gl/xsYEBg. Legalize, tax and regulate cannabis in 2019! My dad had his life ruined for a bag of weed in Wisconsin. 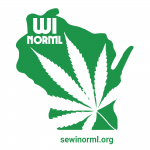 He was branded a felon for life, lost his job, his family and everything else but after 30 years of advocating for the reform of Wisconsin’s worst in the nation cannabis laws I am thoroughly convinced that the state is simply far too drunk, propagandized and ignorant to ever change its totally wrong and failed prohibition laws. I took a club to the head at harvestfest in Madison in 1992 by an overzealous mounted policemen for advocating for reform. Not one thing has changed since. A “March,” huh?? I suggest an alternative! How about all the drug-abusing and family-destroying drug-enthusiast dirtbags ‘March’ their worthless bum butts straight out of Wisconsin? Quit costing us money and lives! Get your blunt-burning bums into your vehicles and head to Colorado, California… anywhere but here. As a retired cop, I’ve had to deal with too many mean and drunk idjits over the years who just wanted to fight with me. Never had to fight with a stoner. They were always annoyingly laughing at everything. Unless they were suffering the effects from some crap street weed laced with God knows what. Most of those were the dumb white kids from the ‘burbs who drove into Milwaukee because they were so bored with their lives in the ‘burbs. Calling their clueless parents was always an event. Legalize it, regulate it, and tax it. @DonaldTrumpNeedstoResign, No, how about all the racist, misogynistic, alcoholic, rot gut liquor swilling, pill popping, opioid addicted, corrupt, hateful, angry, Nazi loving, civil rights violating, vote stealing, freedom and personal liberty trampling, Big Government mooching, family and community destroying Republicans leave Wisconsin, like now! Right now! We don’t want your anger or hate anymore. Wow, DonaldTrumpNeedsToResign really needs to chill out, burn one and take a walk in the woods. You sound very angry and hostile. This aggression will not stand man. 🙂 I wish you more love and peace in your life. Yes, we should legalize, tax and regulate. The hate and anger of the right wing drunks can’t stop us. The vast majority of Wisconsinites agree, 64% in the latest poll want to fully legalize, tax and regulate for responsible adult use, 21 and up like alcohol and over 90% support medocal cannabis and for the first time ever, over51% of republicans finally agree. It’s just a few, old angry bitter republicans left and their days are numbered. Once Walker and republicans are voted out in November, we can move the state Forward again. @DonaldTrumpNeedsToResign, No, how about all you racist, misogynistic, alcoholic, hateful, bitter lying, cheating, pill popping, family and community destroying, civil rights denying, fear mongering, scapegoating, Nazi sympathizing, vote stealing, personal freedom and liberty trampling, Big Government mooching, stinky, dirtbag, slimeball Republicans leave! Pack your bags losers! Wisconson doesn’t want your hate and lies anymore! Better get ready because once we dump the Prohibitionist Career Politician Scott Walker We the People are going to to move the state Forward and legalize, tax and regulate! @DonaldTrumpNeedsToResign, How dare you insult our veterans with your lies and ignorance! You should be ashamed of yourself. Come call us dirtbags to our faces you chickenhawk republican coward! Also you better be really careful who you libel online. Political speech is one thing, but just remember your IP is readily available and you can’t libel private citizens as you just did calling them “drug abusers” and “dirtbags”. Better watch it. Some of them are lawyers! Legalize, tax and regulate in Wisconsin. Let’s end this racist prohibition, get the suffering including little kids with epilepsy and cancer patients the medicine, love and care they need and for heaven’s sake let’s give all of our veterans the medicine they need. Legalize it! My Father just died of cancer and could have grately benefitted from medical cannabis but, unfortunately never received any medical cannabis cancer treatment because of Wisconsin’s current laws. How many more people need to die that could otherwise be saved? Legalize Marijuana!